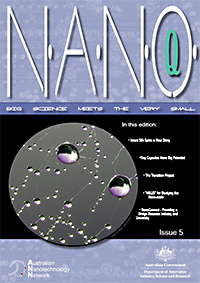 The Nanotechnology field is one of the fastest growing areas of research and technology. The Australian Nanotechnology Network(ANN)(formerly ARCNN) is dedicated to substantially enhancing Australia’s research outcomes in this important field by promoting effective collaborations, exposing researchers to alternative and complementary approaches from other fields, encouraging forums for postgraduate students and early career researchers, increasing nanotechnology infrastructure, enhancing awareness of existing infrastructure, and promoting international links. The ANN will achieve these goals through its dedication to bringing together all the various groups working in the field of Nanotechnology and related areas within Australia. This innovative new network was created by four seed funding networks joining together in order to cover the broader areas and to create a larger more effective network. The National Science Foundation(NSF) and the World Technology Evaluation Center(WTEC) have conducted a study on Nanotechnology Research directions titled "Nanotechnology Research Directions for Societal Needs in 2020 Retrospective and Outlook". You can view this report at the NSF Website. This page has received 17347339 hits.